"Alright guys, thanks for all your help, I&apos;ll see you soon" I say as they get ready to leave and just then (Y/N) walks in the door. "Oh, hey (Y/N) we were just going, it was really nice to meet you." Dallon says giving me a hug on his way out the door. Kenny and Dan just give me a high five on their way out. "Hey beautiful" Brendon says giving me a hug. "Hey, I brought you and josh some ice cream." I say handing them their ice cream. "Its getting pretty late to be honest. Someone should go out to get dinner for us." Brendon said. "I vote Tyler and Josh." I say as they both groan. "But I just when out." Tyler mumbled. "Ugh, c&apos;mon Tyler lets just go. What do you guys want?" Josh asks. "Uh...Just get me a burger and a coke." Brendon says. "Ill have a chicken sandwich and another large mocha chocolate frappe" I say. "Wait, don&apos;t you still have one in the freezer?" Josh asks. "Yeah but I want one for the road." I say and giggle. Tyler and Josh walk out the door and drive off. "Brendon, can I ask you something?" I ask gripping his hand in mine. "Anything" He says as we both sit on the couch. "Brendon, I know there&apos;s something going on. You and the other boys are being very secretive and I need to know why Brendon." I say but then he gets this nervous look on his face and he scratches the back of his neck. "Uh, n-no, nothings going on, what are you talking about, its getting late, Im gonna go to bed, good night!" He says as he takes off to his bunk and closes the curtain. "Brendon, please, you know you can tell me anything." I say walking over to his bunk and he starts to pretend snore. So I just go back out to the couch and I sit down and I look at my texts. And other social medias. Tyler and Josh walk through the door with our food and Brendon gets up and runs to the door before I could get there. We all sit and eat and the whole time Brendon looks really uneasy. "Hey dude, are you feeling ok?" Tyler asks. "Yeah, just pumped for the show tomorrow" Brendon says as he finishes his coke. "I thinks its about time for bed, Im getting tired and we have a long ride tomorrow, then a long night." Josh says grinning at me and we all agree so we get ready for bed. Josh and Tyler were the first to fall asleep. I, like always couldn&apos;t sleep so I got on wattpad to continue my book that I had been reading for a while. "(Y/N), are you still up?" I heard Brendon whisper to me from outside of my bunk. "Yeah, what&apos;s up?" I whisper back turning off my phone and opening my curtain a bit. "I just wanted to make sure your ok and that you don&apos;t need anything" He responds. "Im fine Brendon, I don&apos;t need anything but sleep." I say as I close my curtain and I end up falling fast asleep. "Wake up, Is time to get up, get up every bod-mmpph" Tyler shouts but he was stopped when he had then gotten a mouth full of pillow and Brendon opens his curtain as he looks at me and laughs knowing I threw the pillow. We all get up and try to find something to eat for breakfast. After about an hour of just talking, the boys all decide to play some video game while I continue working on my sketch. "COME ON! Seriously! Tyler, could you let me win once!?" I hear Brendon shout at Tyler. I giggle a bit at this sudden outburst. "Haha, I will if you ever get better than me" Tyler says. I end up putting in my ear buds and listening to my playlist on my phone. Before I know it Brendon had unplugged my ear buds and told me it was time to get ready for the concert. I ended up putting on my favorite shirt. Its a plain white tee that has three small boxes with a small statement next to them. The first one said &apos;single&apos; the second said &apos;taken&apos; the third on had a check in it and said &apos;mentally dating Brendon Urie&apos;. Then I get my black ripped skinny jeans. Along with a red flannel, my red converse, and my red beanie. I did my makeup and tried to hide my stitches the best I could. When I walked out of the bathroom all eyes were on me. "What?" I asked wondering what the heck was going on. "Nothing, you just look great...and I love your shirt" Brendon says as I giggle at his remark. I walk up to him and give him a great big hug. "(Y/N), tonight&apos;s gonna be a big night, were doing some thing a little different tonight and to be honest, im a bit nervous" He says as I just hug him tighter. "Brendon, no matter what&apos;s gonna happen tonight, your gonna do great." I say hoping he&apos;ll feel a bit better. "Ok, (Y/N), there&apos;s gonna be a big mob of fans out there and we don&apos;t want them to see you, so were gonna go out first and distract them while you and Brendon run as fast as you can to the doors. ok?" Tyler tells us and we both nod. Tyler looks at Josh and Josh gives him an encouraging nod. They both walk out the door and all of a sudden I can barely hear my own voice over all the screaming. "Ready?" Brendon asks gripping my small hand in his. "ready" I say and we both take off out the door as Dallon, Kenny, And Dan all come out to help distract the fans. Me and Brendon had ran as fast as we could and into the building. Brendon and I lean our backs against the doors breathing heavy and chuckling a bit. "Haha, I cant believe we just left them there." I say trying to catch my breath. "Yeah, they&apos;ll be fine. Come on, lets get to my dressing room." Brendon says as he leads me there. Tyler, Josh, Dan, Kenny, and Dallon all met us there. "Your welcome by they way" Dan says glaring at Brendon. "Yeah, Thanks." He says  and Pretty soon its time for everyone to go to separate rooms. Tyler and Josh go on first and I sit backstage watching them. About an hour later Brendon goes on and Josh comes backstage to check on me and grab some water. "So how are you doing?" He asks. "Im good, what about you?" I ask back. "Im doing pretty good. Just really thirsty." He says and I hand him a bottle of water. "Thanks" "no problem" I say. Josh just gives me a smirk. "What&apos;s so funny?" I ask. "Nothing, just get ready." He says and walks away. I was really confused by what he said. &apos;just get ready&apos;? What&apos;s that supposed to mean? I just sit there thinking for about an hour before all the lights go out and screams fill the concert. Then I can see the big screens with words on them but I cant tell what it says. Soon Brendon walks to the mic and clears his throat witch for some reason makes the crowd go wild. "Ok guys, now, tonight were going to do something a little different. I have someone very special to introduce you guys to." He says and with that I can hear him walk off the stage and the lights go out again. Suddenly I feel a hand on my wrist and someone starts pulling me and I pull back stopping them. "Who, what, what&apos;s going on?" I ask. "Shhh" I hear the person say. The voice is very familiar. "B-Brendon?" I ask but then I had been pushed. Pushed out onto stage. A stage light appears on Brendon as he was still pulling me on stage until he stops at his mic and the crowd goes crazy as I just stand their frozen in front of millions of people. "Now like I was saying, this is (Y/N). A very special, I repeat, VERY special girl." He says and the crowd screams even louder. I look around and every word Brendon says comes up on the big screens t were there. I keep looking around and I see Kenny grinning at me and Josh and Tyler Giving me a thumbs up. "She has gone through a lot the past week, as you can tell." Brendon continues and then a picture of me after surgery shows up on the screens. "Before I met her, she was just another fan. But little did I know, she&apos;d be much, much more than just another fan. She had saved up $1,458 just to meet me at one of my concerts. And, her mom, thought it would be a good idea to take her ticket" Brendon says chuckling as he was cut off by boo&apos;s. "But little did (Y/N) know, her mom was planning something bigger. Something that would change her life. And little did we know, it would change mine too." Brendon said looking at me and giving my hand a comforting squeeze. The crowd just screams louder and louder. "As her mom was talking to me backstage, I told her I would like to take (Y/N) on tour with me, and she happily agreed. Haha, man, when (Y/N) met me, we were both a mess. I had tripped on a brick..." He says but I sort of stop him by laughing. "Which she apparently thinks is funny." Brendon says laughing and the crowd and everyone on stage and backstage starts to laugh. "Anyways, after a while I drove her back to the tour bus where she had been surprised two more times." He says and Tyler and Josh come running out and they hang their arms over my shoulders. I smile a bit as the crowd just keeps screaming. "Then, after a while, I had asked her out to dinner" Brendon says smiling at me. "And, I had found something that surprised me." He then says as the one sketch from girls/girls/boys shows up on the screen. "She was such a talented artist. After about 10 minutes of talking she agreed to show us the rest of her sketches." Brendon says showing a slide show of my sketches. "Then my favorite sketch came up with a caption on it. It read &apos;Brendon, my superhero. The one that I could always feel that special connection with even though we had never met. The one who isn&apos;t scared to tell the world anything. The one that helps my depression. 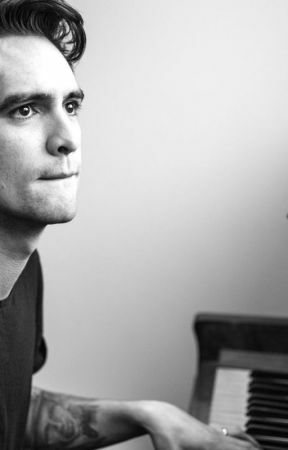 My one and only, Brendon Urie&apos; When I had read this my heart melted." He said and standing there on stage I covered my face as I was trying not to cry and I could feel Brendon&apos;s eyes on me. "After dinner that night there had been a terrible incident with someone I shall not name. (Y/N) was rushed to the hospital and she had almost lost her life. Luckily the doctors were quick enough. And even though it wasn&apos;t my fault, I will never forgive myself for those three stitches on her face." He said as he gave my hand another comforting squeeze. "A couple days later one night I had woken up late at night to the most beautiful voice. (Y/N) had walked outside and was singing &apos;This Is Gospel&apos;. After a couple minute I started to sing along with her. To me it felt like there were no troubles in the world. It felt as if we were the only two people in the world. I knew she was the one." Brendon says looking at me and seeing the tears forming in my eyes so he pulls me close to his chest and whispers in my ear but it ends up going through the mic. "Shhh, its gonna be ok." The whole crowd just screams in aww&apos;s.  "Now, When she found out I had heard her sing, she was really insecure. She had thought she was the worst singer ever. I had told her that not just me but Tyler and Josh thought she was great. She got even more nervous when she found out that I wasn&apos;t the only one that had heard. Now, (Y/N), did you believe me when I said your a great singer?" He asked holding the mic to my mouth. At this point I was so scared that when I said no it came out as a tiny little squeaky no. "See guys, she doesn&apos;t believe me, or Tyler, Or Josh, So were gonna let you be the judge of it" He said as the crowd screamed loud and the lights went out. All of a sudden a light starts on Tyler on the piano and Josh on the drums along with Dan. I soon recognized the song. &apos;This Is Gospel&apos; then another spotlight came onto me and Brendon and I had my own mic in front of me as Brendon started singing. "This is gospel for the fallen ones locked away in permanent slumber"
He sang and pointed to me telling me its my turn to sing. The crowd goes crazy as I shake my head no while I was extremely scared. The music stopped as Brendon had cupped my cheeks in an embrace. "(Y/N), I know you can do it. Your amazing at singing and I want the world to know how great you are, how special you are to me." He says gaining screams from everyone there. "Im not afraid to show the world who you are to me. and neither should you" He says. "B-brend-" I tried to squeak out but I was stopped when Brendon had pressed his lips to mine with a passion that I had never felt. The crowd gets louder than ever. "Please (Y/N), show them that your worth something." He says. 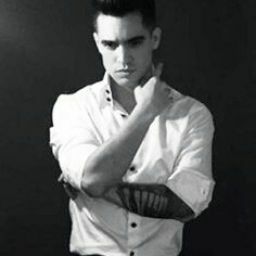 "B-Brendon, I just cant" I say and run off the stage to his dressing room.